The days of fretting bankruptcy are a distant speck in the rear-view mirror, and the company is well positioned as we head into the next decade. It wasn't that long ago that Cleveland-Cliffs (NYSE:CLF) looked like a company on the brink of insolvency. A few incredibly ill-advised investments right at the height of the commodity boom in 2010 left the company with loads of unprofitable assets and an onerous debt load. These factors were a large reason activist investors shook things up and put current CEO Lourenco Goncalves in charge. Under Goncalves tenure, the company was able to avoid bankruptcy, an achievement Goncalves has said was his biggest accomplishment. Since then, the company has been making all the right moves to turn itself back into a profitable business and is now churning out relatively steady profits. Now, it looks like management is going to turn its attention to rewarding shareholders for sticking through these tough times. Here are a few quotes from the company's most recent earnings presentation that hint at better days ahead for Cleveland-Cliffs investors. Considering the size of the financial hole in which Cliffs found itself, I think it's fair to say most investors thought it would take a long time to turn the company into a consistently profitable company with strong financial standing. After selling off all of its unprofitable assets and using some well timed financial moves, the company has been able to achieve that goal in a little less than three years. Over the past three years, we have planted the seeds to generate enormous amounts of free cash flow and to expand our business for the future. We have transformed this company into one that's now able to take full advantage of our strength within the Great Lakes markets, including high barriers to entry, the quality of our pellets, our technical expertise, and last but not least, contracts to sell pellets a lot more favorable to Cliffs. One of the things that went away during the commodity price downturn was Cliffs' dividend. There simply wasn't enough cash coming in the door to justify giving cash to shareholders at the time. 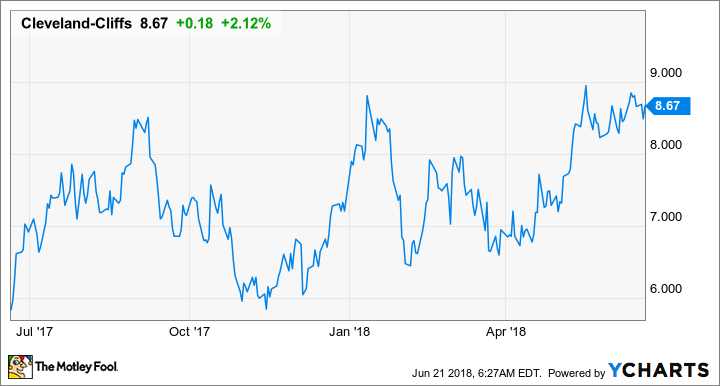 Now that the company is back on the right track and management is talking about things like free cash flow, though, there are likely a lot of investors out there wondering if this will lead to share buybacks or a dividend payment. Beyond this priority, HBI and taking care of our 2020 and 2021 debt maturities. We are going to start thinking about returning capital to shareholders, and we are not going to be telegraphing that too much. At the right time, we will do it. And I believe that I have been communicating very well to the various shareholders and stakeholders in general, that my primary way of doing that will be establishing a dividend. HBI is Cliffs' hot briquetted iron facility being built in Toledo, it is the company's first venture into supplying feedstock for electric arc steelmaking furnaces. Cliffs has historically been a supplier of pellets for blast furnaces, but more and more steelmaking in the U.S. is coming from electric arc furnaces and requiring a more refined product. Most of the funding for HBI is in place, and those debt maturities are about $300 million in total. Based on the company's recent earnings reports, it should be able to generate enough cash to cover these expenses in short order, and it wouldn't be shocking if we saw a dividend as early as 2019. [W]e celebrated the official groundbreaking of our HBI plant in Toledo, Ohio. However, because we will obtain all our permits in record time, we were actually able to start the physical work almost two months ago and are currently ahead of schedule. The project team has working quickly in awarded civil works, piling, and foundation contracts which will allow us to begin setting steel in the third quarter of this year. Thus along with the great progress made so far at Northshore [mine] puts us well on track to deliver DR-grade pellets to Toledo by the end of 2019 and to deliver customized-HBI to electric arc furnaces by mid-2020. Adding another mine that can deliver DR-grade (industry lingo for very high quality) pellets in the next 18 months and the building of this HBI facility in two years will do a lot to move the needle for Cleveland-Cliffs. Mining iron ore isn't exactly the most stable business out there. The industry notoriously vacillates between periods of over-and-under supply that can make investing for the long term in this business incredibly tricky. Also, we have seen first-hand what can happen to a business that invests in questionable assets and takes on a lot of leverage. So, I can understand why Cleveland-Cliffs isn't a stock for just anyone. That said, I don't think Wall Street is properly valuing the opportunity in Cleveland-Cliff's stock right now. It is in the best financial position it has been in for years, it has supply contracts in place that will ensure steady demand and decent margins for several years, and the addition of a new mine and an HBI upgrading facility will likely add a lot to the bottom line over a rather short timeframe. As it stands, Cleveland-Cliffs has a PE ratio of 8.3, and that is on a trailing-12-month basis, where profits have been constrained by its discontinued operations in Australia. As these assets come off the books from a recent sale, and these new U.S. facilities ramp up, it's incredibly reasonable to expect a significant jump in earnings. Plus, it looks like the company will be reinstating a dividend sooner rather than later. Add it all up, and I think investors have a very good shot at achieving a high rate of return on an investment in Cleveland-Cliffs today.